Result of BTC TET, Assam 2017- Total of 358 Candidates declared successfull. - Jobs4NE : Jobs in Assam and North East India. Result of BTC TET, Assam 2017- Total of 358 Candidates declared successfull. Assam TET (BTC) Result has been declared by TET Committee for Assam (BTC) Secondary Education. Govt. of Assam decided to make Teachers’ Eligibility Test (TET) compulsory for any new Recruitment of Teachers in the Secondary Schools to offer quality education in the secondary schools of Assam. The Teachers’ Eligibility Test for BTC/ NCHAC area was held on 8th Januray, 2017 in 6 zones across the Assam. In this exam a total of 358 candidates has been declared successfull out of 2756 candidates appeared in the Assam TET ( BTC). 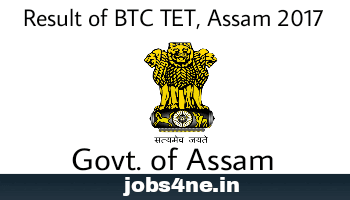 Assam TET (BTC) result can be downloaded from below given link.